Balinese traditional painting is a unique cultural heritage; sometimes a master painter will devote an entire year to the completion of one canvas. This workshop (suitable for all ages and abilities) concentrates on understanding and using the traditional motifs which give these works such depth and meaning. A totally hands-on experience, this class will take you deep into the mystery and romance which is Balinese art. Balinese traditional painting was always a two-dimensional world; using repeating figures, natural or historical or religious themes were painted with the few natural colors available to the island’s artists. When European artists discovered Bali 100 years ago their impact upon Balinese painting was immediate and fundamental. Balinese artists suddenly had access to vibrant new colors, commercial canvas, artist oil mediums and a three-dimensional visual field! The island’s artists were quick to discern the new ways of expression that were now available to them. Today, Balinese painters execute painted art in every conceivable modern expression- impressionism, expressionism, pop-art, renaissance style, cubism, abstract art and many other painting styles. Today, Bali is a popular destination for artists from all over the world who desire to immerse themselves in this unscripted artistic community. Despite the immense influence of off-island art and artists, many Balinese artists have elected to express themselves with the two-dimensional, repeating figure art of their forefathers. This art form is culturally rooted to Balinese society and thus evokes for the Balinese a more intimate connection with the artist’s efforts- more meaningful than any other acquired artistic expression. 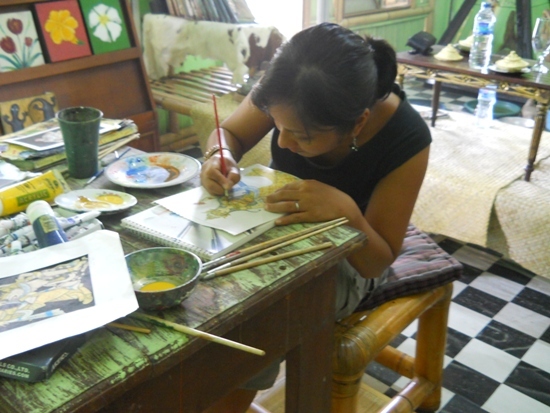 For many Balinese artists, the purpose of art is to signal the artist’s connection to Bali itself. Spend a few hours with our painting guru and get a taste for this uniquely Balinese style of painting. One can choose from a variety of traditional Balinese subjects, draw [with our help if needed] a sketch on canvas and proceed to color the subject using a painting style that has been handed down by generations of Balinese painters. Our instructor will guide you through each step so you don’t need to be an experienced artist yourself.